*PLEASE NOTE: Balloon Liftoffs & Glows times are always dependent upon weather conditions. Attendance: Up to 25,000 spectators are expected to enjoy this signature event. 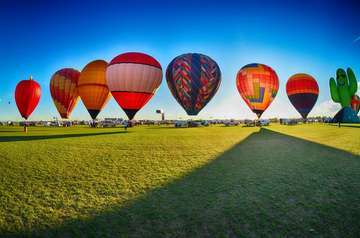 Balloons: Up to 25 hot-air balloons, including special shapes, will participate. Beneficiary: St. Vincent de Paul – We are having a Peanut Butter & Shoe Drive for the homeless. Bring a jar of plain peanut butter or a pair of men’s or women’s shoes to the Arizona Balloon Classic and be entered to win a “Raffle” Prize. The challenge is to fill a 48’ tractor trailer during the Arizona Balloon Classic to be deliver full back to St. Vincent de Paul. Events: The Arizona Balloon Classic” – On Saturday and Sunday mornings, December 19th and 20th, the sky will be filled with colorful hot-air balloons participate in thrilling Dunkin Donuts “Hare & Hound” races from the grassy fields of the West Valley’s Fear Farm Sports & Entertainment Complex for a spectacular sight of mass and color. Spectators are allowed to walk on the field and experience the balloons inflation and lift off. Photo taking is invited. DESERT GLOWS on Friday and Saturday evenings, December 18th and 19th are our most popular attended events. A field full of illuminated, tethered, hot air balloons will glow in time to music. Fireworks Spectacular to follow on Saturday ONLY – December 19th. Admission: For any one day - $15 at the gate. Active Military and Children 12 & under are always FREE. Group ticket packages available. General parking $5. PLEASE NOTE, NO PETS ALLOWED. ALL BALLOONING EVENTS ARE DEPENDENT UPON WEATHER CONDITIONS. NO REFUNDS. RAIN CHECKS OFFERED TO OTHER BALLOON EVENTS DUE TO CANCELLATION.